Speedy The Cat & Friends is featuring Operation Write Home in honor of our birthday on their challenge blog! Speedy's Friends like to have very easy challenges - a no stress card that you can just have fun making. We were created by our sponsor, Mark's Finest Papers as a way to share MFP stamps and products. For every 50 entries we have, MFP will send out a FREE STAMP SET to the random drawn winner! We have had a lot of very happy winners~~ You could be one! Our challenge is posted every Saturday and runs through the following Friday. We are thrilled to be participating with Operation Write Home on our September 18th challenge!! Geri Utterbach from Speedy The Cat & Friends has made a sample card for our inspiration! To see more of her beautiful creations please visit her blog Geri's Cards. 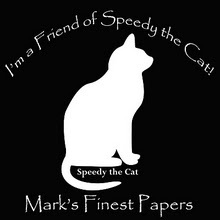 Here's a link to Speedy The Cat & Friends so you can play along!